Histories: Why did couples in the 19th century marry on Christmas Day ? Why did couples in the 19th century marry on Christmas Day ? It was not uncommon to be married on either Christmas Day or Boxing Day in the 1800’s because they were days when working people were not expected to work. Christmas Day and Boxing Day were traditional holidays and are not, and never have been, bank holidays. For these, we need to thank the banker, Sir John Lubbock and his love of cricket. Christmas Day and Boxing Day were two days when people officially didn't have to work. In the 1800s most people worked six days a week and didn't get paid when they didn't work which, of course, most could ill afford. It wasn't like today when you can just take a days holiday to marry. It was only with the rise of the labour unions in the twentieth century that working conditions and employee rights started to improve. 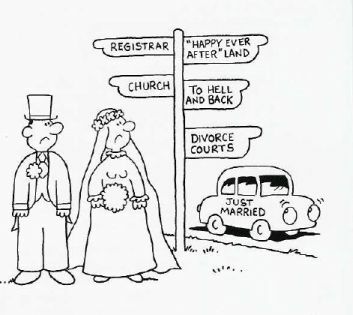 Marriages were uncomplicated. Just 3 readings of the banns on 3 consecutive Sundays. Best clothes would be worn as they would be in any case for any Sunday. Dancing and making merry in the local barn and that was it. 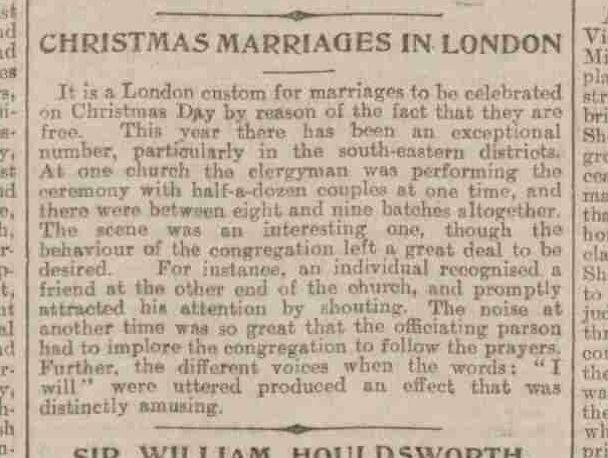 In addition, as you can read on the article from December 1900 below, it was a tradition that churches, certainly in London, offered free marriages and baptisms on Christmas Day and at Easter. There used to be a difference between a public holiday and a bank holiday. Public holidays which are NOT technically bank holidays are days such as Christmas Day and Good Friday which have always been observed as holidays. The first “bank holidays” were introduced by Sir John Lubbock who was a banker who loved his cricket and couldn’t stand the idea of his competitors gaining an advantage by trading on days he and his staff went to support or play in the local village cricket matches. He introduced the Banking Act 1871 which recognised four official bank holidays – Easter Monday, Whit Monday, first Monday in August and Boxing Day. What is strange is that each year because of the vagaries of the calendar, the actual dates when these bank holidays fall has to be announced by Royal Proclamation. This stops some bank holidays falling on weekends and when this occurs the bank holiday is technically renamed a “bank holiday in lieu” or “substitute day”. While it is true that we have less bank holidays in the UK than in other countries of the European Union, the difference is not as great as widely thought as they do not have “substitute” days and when a holiday falls on a weekend the day off is lost !